There is less than a week to go until the capital sees the introduction of the Toxicity charge (T-charge) where older, more polluting vehicles will have to pay to enter central London. It is the brainchild of London Mayor Sadiq Khan who has made it his aim to clean up the city's air. London is again at the forefront of congestion and pollution controls. The Congestion Charge and Low Emission Zone are already in place but the T-charge is one of the most radical pollution measures this country has ever seen. 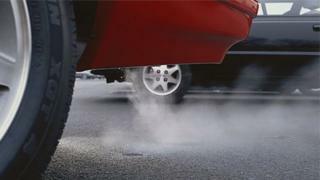 From Monday 23 October, there will be a £10 fee for those who drive more polluting vehicles. Heavy polluting vehicles will have to pay if they enter the congestion charging zone of central London - and this is on top of the £11.50 congestion charge. The zone will operate between 07:00 to 18:00 - Monday to Friday. Nearly all vehicles will have to comply with what is called the Euro IV exhaust standard or pay the charge. That standard defines the acceptable limits for emissions and covers cars, vans, buses, coaches and lorries. That's roughly vehicles registered before 2006 . You can check if you will have to pay by clicking here:. While air quality campaigners have welcomed the plan and say it is about time London's toxic air is cleaned up - it will not be universally welcomed. Sue Terpilowski, from the Federation of Small Businesses, said: "The introduction of the T-charge, comes at a time when small and micro-businesses in London are already facing astonishingly high property, employment and logistics costs and there is a fear that this will be the final straw that closes businesses and takes jobs." And this is just the beginning as the pollution controls in London will gradually be tightened. The T-charge will only be in force until the Ultra Low Emission Zone (uLEZ) is introduced. That starts in 2019 also initially covering the same area. But the crucial thing to remember is, that the plan is to expand the boundaries of the uLEZ and to include even more vehicles by ramping up the exhaust emission standards. So the T-charge is really just the beginning.